I never imagined, in my wildest dreams, that I would be writing about an endless procedurally generated golf game. Even writing that last sentence feels weird. And yet, here I am, writing about a game I’ve become obsessed with. Like my first sentence alluded to, Desert Golf revolves around plain, 2D course, where holding your finger on the screen, moving it in a direction and releasing whacks the golf ball in a specific direction. 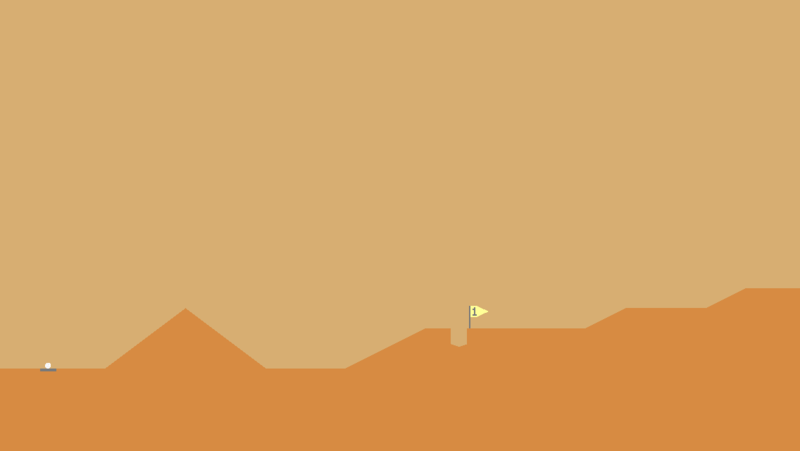 The course is procedural, so you’ll get random geometry sticking out here and there, and once you’ve potted you ball, you’ll then proceed to the next stage, which simply encompasses the viewable screen moving to the right a certain distance and pushing your ball out of the hole to try again on the next course. I’m not even joking. The entire game encompasses what I described above ad nauseam. There’s no music to speak of, no change of scenery (albeit the colour of the ground slowly changes hue over the 250 holes I’ve so far played), and no change of mechanics. And yet, despite how little this game has to offer, I’m absolutely hooked. The simplicity of the levels can be a random mix of difficult shots (where you’ll need to use the curvature of the land to bounce the ball correctly) all the way to the mundane where a simple tap will suffice. It’s addictive to sink one hole after another, all the while your score at the top of the screen is increasing. the score is used as an indicator for how well (or bad) you’re doing, with a twitter icon appearing occasionally to share your progress with friends. I (thankfully) found I was 200 shots below a friend at the 200 mark, a massive achievement for myself, and one that helped in keeping me hooked to the game. So when will the madness end? Well I recall the Giantbomb crew talking about Desert Golf, and from what I remember, it really does never end, with many giving up after a few thousand holes. Is Desert Golf worth your time? Yes yes and hell yes. Looks can be deceiving, and for Desert Golf, that works in its favour, with a simple but challenging mechanic taking it far further than I could ever imagine. Time will only tell how far I actually get, but for now, I’m hooked.